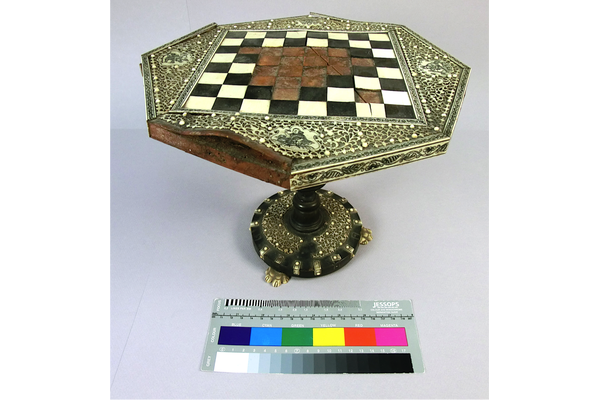 This is a privately owned 19th century Anglo-Indian chessboard on a turned stand from South-East India. 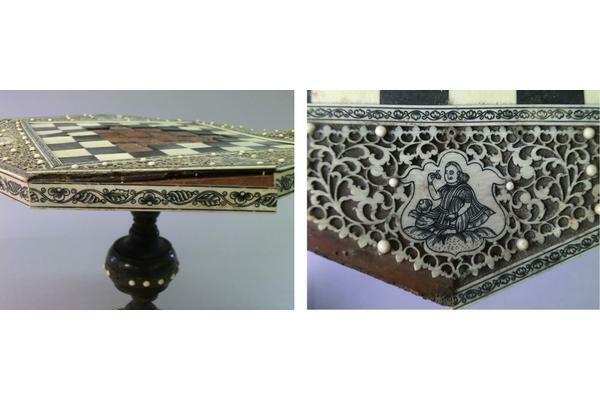 It has a sandalwood substrate decorated with ivory fretwork on a turtleshell background. The ivory side bandings are engraved and highlighted with a black lacquer. 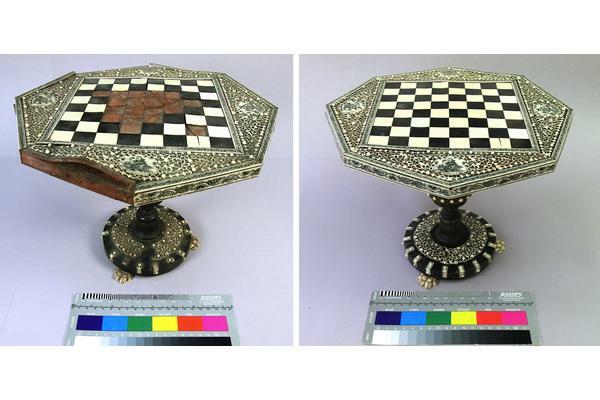 The contrasting squares are made from ivory and a black horn, possibly buffalo horn. 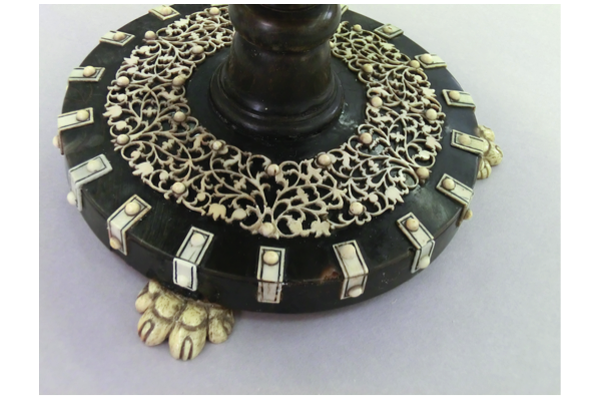 The column is made from separate sections of turned horn and the paw feet are carved in bone. Interestingly, there was no ebony found on this object. 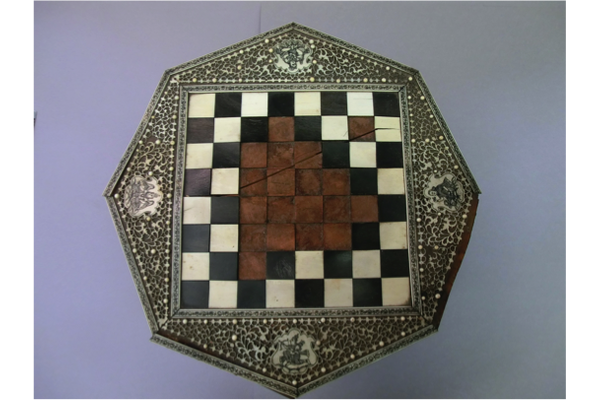 The chessboard had suffered from humidity fluctuations, eventually resulting in a split in the wooden substrate. 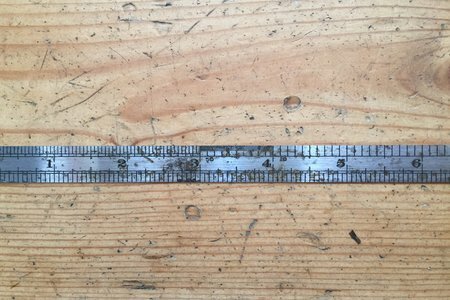 Furthermore shrinkage and permanent deformation of the substrate had resulted in a distortion of the tortoiseshell and the loss of ivory side banding as well as the loss of a great number of squares. 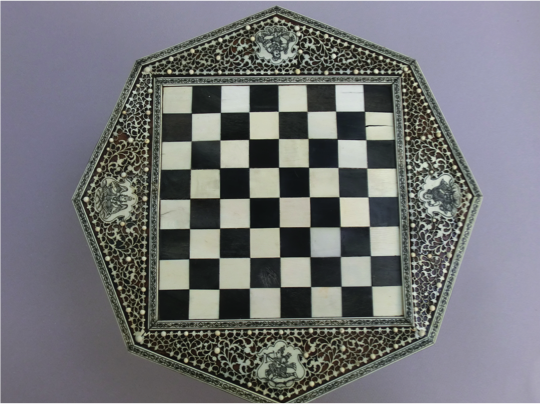 The client's wish was to have the the object fully conserved and all the losses replaced. The proposed treatment was to give the object a good surface clean, consolidate all loose or detached parts and replace all the major losses. Cleaning was done using cotton swabs dampened with saliva and gently wiping over the surface. 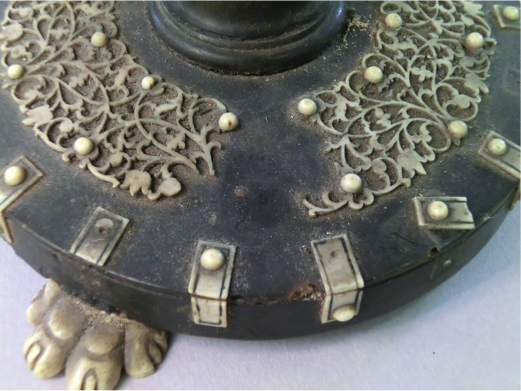 The area between the ivory fretwork was cleaned using cotton swabs on the tip of a bamboo stick. 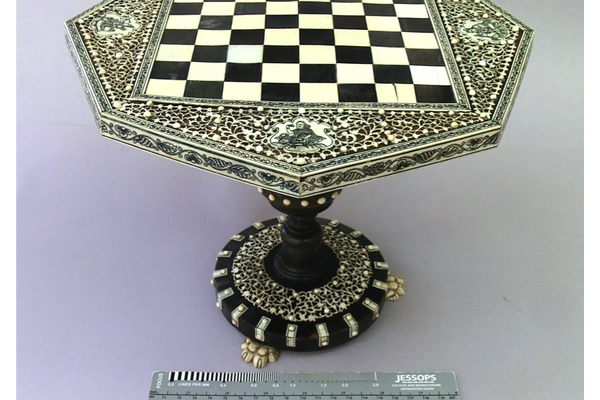 The use of real ivory is unethical so in order to replicate the missing ivory and horn squares, an epoxy resin was used. It was mixed with pigments and poured in ice cube trays. 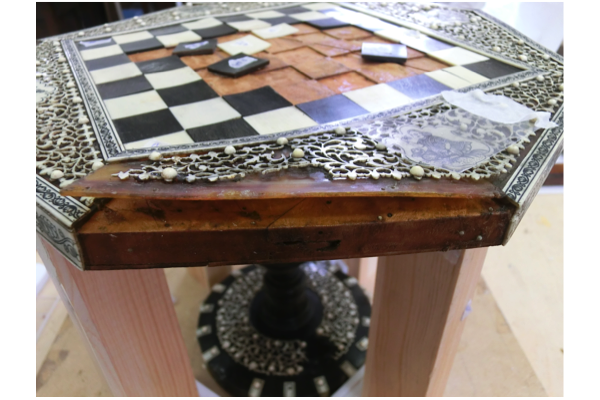 A very light stable resin was selected to prevent the pieces yellowing over time. 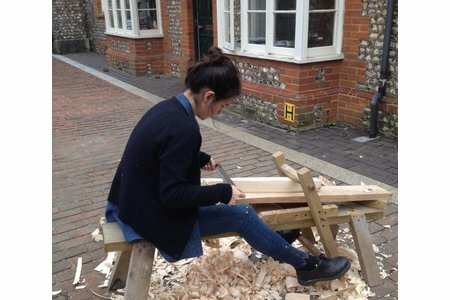 After curing, the cubes were sanded to the right thickness and the sides were then planed square with a block plane. The squares were glued to the substrate with a synthetic adhesive. The split was left untreated since it did not weaken the substrate significantly and, since it was not going to be seen once covered by the squares, there was no need for an aesthetic fill. 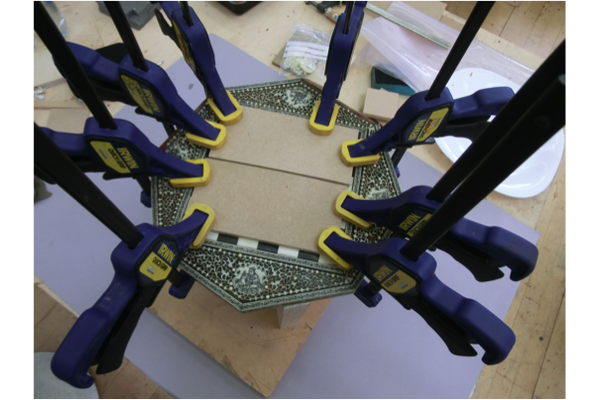 To obtain a smooth and flat surface, pieces of MDF that were heated in a microwave oven for 30 seconds were clamped onto the surface. 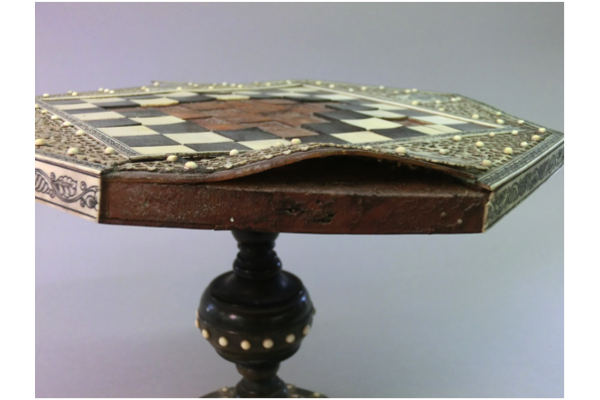 The heat softened the adhesive, pressing the squares flat and flush with one another. 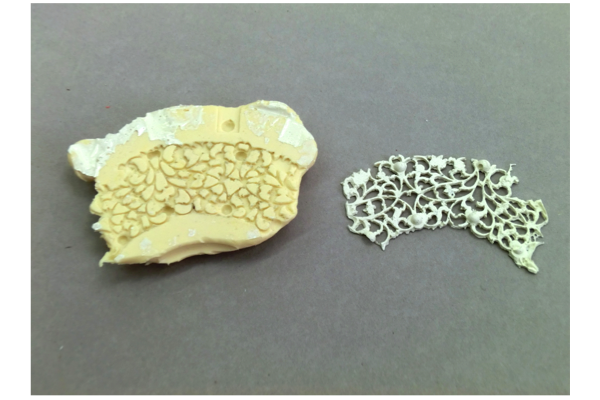 To replace the loss of ivory fretwork on the base, a silicon mould was taken from a complete section of fretwork on the base. 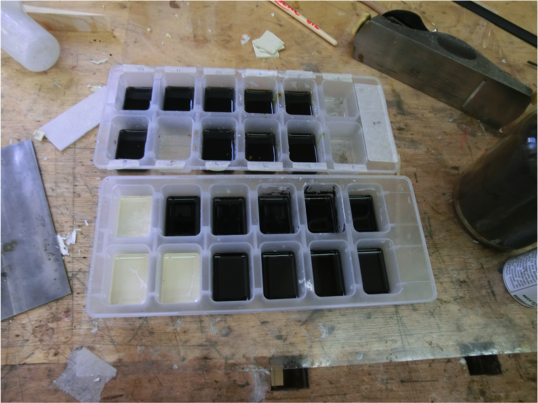 Epoxy resin mixed with pigments and fumed silica to increase the viscosity was then poured into the mould. After the resin had cured it was removed and cut to the size of the loss. The new piece was glued onto the horn background with a synthetic adhesive. The distorted turtleshell was partly released from the surface and by softening it with heat and steam from a hot and damp cotton cloth. Once released and softened it partly regained its original flat shape. Because the substrate had shrunk there was a small excess of turtleshell on one edge. This had to be trimmed off to make it fit before gluing back onto the substrate. 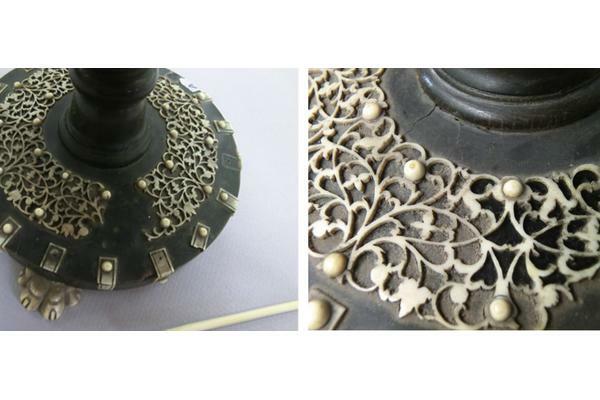 We were given the opportunity to use the laser cutting machine at Midhurst College to explore its potential to reproduce the decorative engraving on the ivory side banding. The high intensity laser beam of this machine is capable of producing very narrow cuts in materials such as perspex, veneer and other sheet materials. 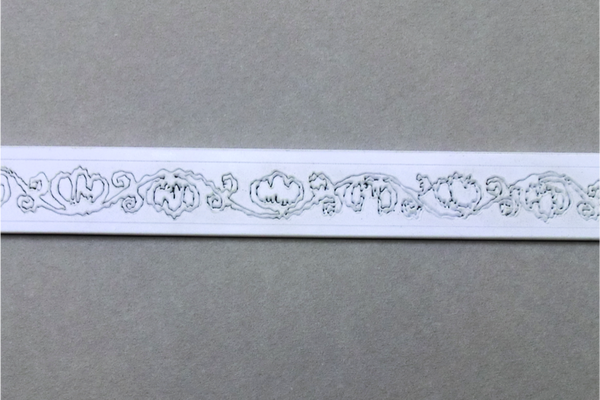 A high resolution picture of one of the original side bandings was taken and converted to a file that could be used by the laser cutter to produce the engraving. 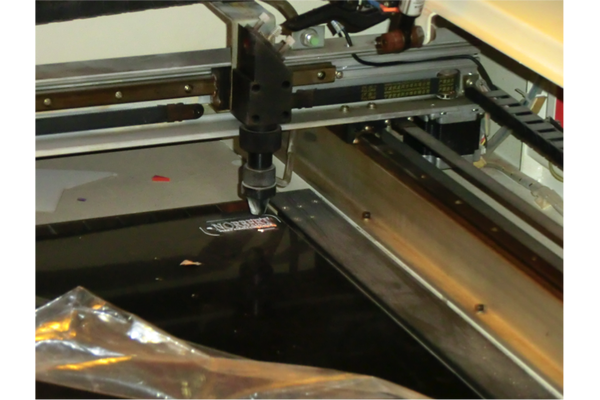 We did a test engraving on a piece of plastic and more experimenting is required to determine the settings of the laser cutter such as the intensity of the laser beam for the specific material to be used. With some fine tuning it could prove to be an efficient method to use in the future. 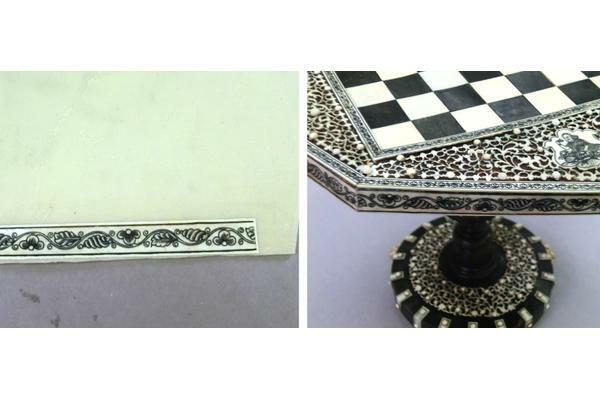 Our ultimate solution to replicating the lost side bandings was to use a photographic reproduction of one of the original engravings. 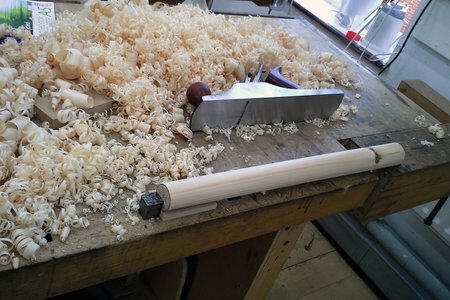 This is a technique commonly used by conservators when copying the historic method not feasible. 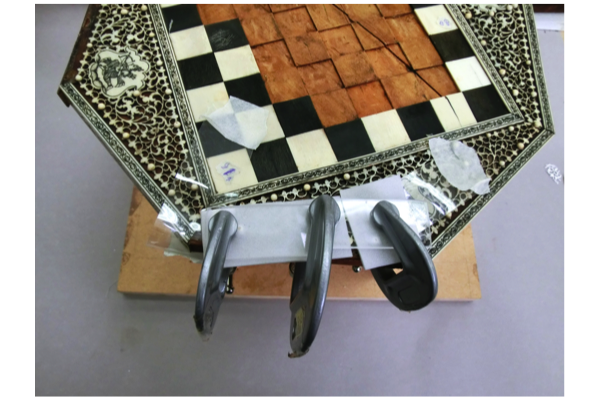 The aim is to fill the loss with a sympathetic material so the pattern is completed visually and is not an obvious replacement, but that is easily discernible on close inspection or when using an ultraviolet light. 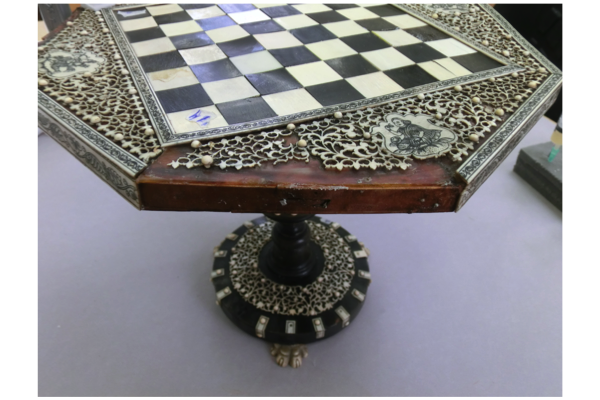 The printed image was then glued onto a sheet of imitation ivory and sealed with a synthetic resin to protect it from handling and give the appropriate gloss. It was then cut to size and glued onto the border.